After a bit of a pause due to hitting a couple of decisions that we got stuck on and getting involved in some Big Art, we’ve finally started up again. Trailer base put together. Seen here just before cutting the grooves in the cross beams for the ground effects. Roofing tar (water-based clean up!!) going on next. Why do we build these things? To go camping! Even though we’re not done with the Toaster, it’s still camping season, so of course we’re going to get out a bit here and there. What you bring with you changes a bit from tent camping (car camping at festivals to be specific). Roy and I had our gear, both the packing and unpacking of it, down to an art. Two trunks, first one was packed with (in order from top on down to the bottom): a tarp, its stakes, our tent, its stakes, air mattress, battery powered pump, batteries for the pump in a baggie. Second one was sleeping bags, giant horse blanket, first aid kit, toiletry kit and lights. 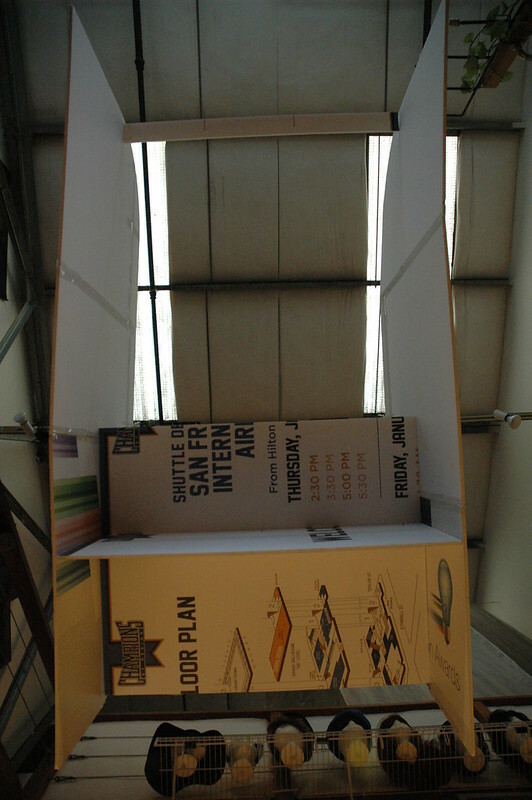 We brought our clothes/costumes in bins that fit inside a trunk, the other served as a bench or low table. Food came in coolers, and we did the best we could. 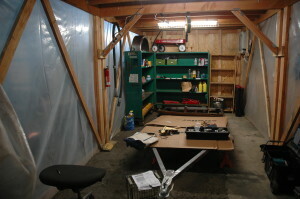 Teardown was: box up laundry, pack the lights, sleeping bags, blanket, toiletry kit and 1st aid kit in one trunk. Second trunk: deflate air mattress with pump, take out and bag batteries, pack batteries and pump on the bottom, fold mattress, pack on bottom, take down tent, pack tent and tent stakes, clean tarp, pack tarp stakes and tarp. When I first decided to build Shorty, it was because we had to pack up one too many times in the rain, or after the rain, or someplace extraordinarily soggy. I was done flicking slugs off the bottom of the tarp, of checking for spiders before packing the trunk, of having to unpack the tent to dry it before tucking it completely away. 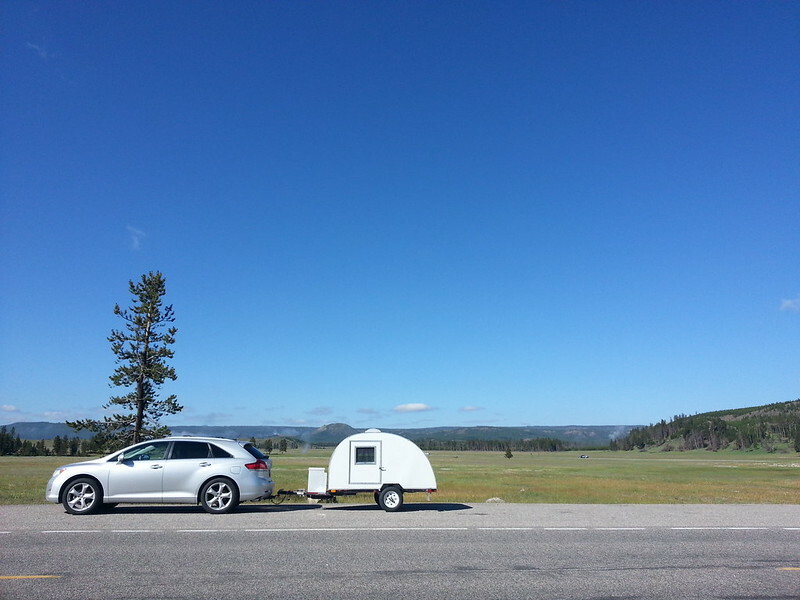 Traveling with a trailer is a pretty great thing, both for extended roadtrips and for festivals, but the way we use it is a little different depending on the context. Last summer, we went on a 3 week tour of the Western interior, hitting up places like Yellowstone, Grand Teton, Glacier, and several smaller parks in between. This summer, it seems we’ve been hitting festival after festival, and the differences between the two contexts are worth mentioning. For roadtripping, we like to be able to pull over and have a picnic out of the back and be able to pull over and crawl into bed, no matter where we are. All clothes and toiletries must fit in the cabinets, although we do keep a laundry bag stashed in the footwell. Doing laundry on the road helps keep the volume of clothes you need to bring down, and provides a nice pause in places you normally wouldn’t stop. We make the bed every morning once we’re out, because someone will stop us at some point during the day and want to look inside, and it makes it easier to climb in at the end of the day without needing to untangle the sheets. We keep two floor mats to put outside each door. They provide a good place to kick your shoes off. We also bring our camp chairs to put our feet up and watch the sky at the end of the day. The galley is also pretty spartan. Cooler and stove live back there, along with the storage drawers and bins for dishes. Dry goods live in a picnic basket that travels in the car (because driving munchies), and a small cooler for drinks also lives in the car (because driving caffeine). We took to keeping a small container with cold cuts, cheese, mustard, and pickles in the drink cooler, which made it easier to grab that and the basket and picnic wherever the mood struck us. Larger food lived in the large cooler. Mornings were usually tea, yogurt, and granola. Lunchtime, sandwiches and chips. Dinner, some larger thing we’d keep frozen in the large cooler. (hm, maybe we should do a recipes post soon.) Everything gets washed and put away asap. A couple of games, a couple of solar lights, not much is needed when you’re in a different place almost every night. We are still working on the Toaster, there will be updates at some point, but we do still have a few more roadtrips and campouts planned for what’s left of summer. When I was little, I would entertain myself making paper dolls. I’d make them out of anything I could get my hands on, comic books, newspaper ads, magazines, I would cut out things that caught my eye. I had a file full of women, men, animals, tools, dishes, and sheets straight out of catalogs of fully or partially decorated rooms. Rainy afternoons or winter evenings, I would set up a TV tray, pick a setting from my room collection, and start to assemble a scene to play with. Turns out, I still play with paper dolls. When you want to make a full scale model of something, you need a cheap and easy material to work with that can handle some abuse. Thanks to the lovely people at SCRAP, I found just the thing. SCRAP winds up getting all the signage from conferences at Moscone (and probably other places I’m not aware of). That means they are usually swimming in sheets upon sheets of foamcore. Not just any foamcore, either. The stuff they have is 1/2 inch thick, and surfaced with a thin plastic. This stuff is meant for holding up to being stumbled into and knocked down. Perfect for cutting and pinning together with 8 penny nails. We taped together some larger sheets and cut out the side profile, then cut the pieces for the shelves, counters, and cabinets. Today, we pieced them together. The plastic coating has a satisfying snap and the 8 penny nails make a nice squeaking sound as you punch through. 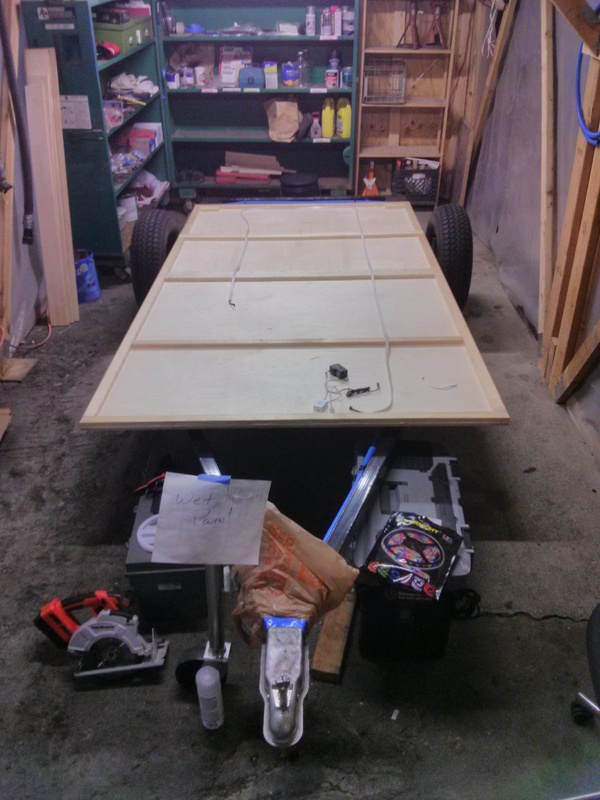 All the horizontals are placed, so the next step is to grab the mattress out of the current trailer, throw it in the mockup, and see how it feels spacewise. At this point, we can decide on things like “Do we want to modify the headboard or scrap it completely?” “Should we lower the cabinets?” “Will a shoe and blanket shelf fit in the footwell?” Since it’s just foamcore and nails, we can pull the nails and move things where we want, and compare how the different placements feel. Next up are a few camping trips. I’ll go into prep for those here a little later on to share and enjoy! I really didn’t intend to spend much time at the shop that day. The grease gun shot a 5 inch cylinder of red grease into the air. And I’d grabbed it with my cleanish, right hand. So there I’m standing, with a grease burrito (smaller style, not a giant San Francisco Mission Style burrito, only 2-2.5″ diameter) in one hand, the greasy body of the gun in the other, a ear plug in the good ear that I’m not going to be able to take out for a while, and my cell phone in my pocket that I sorta hope doesn’t ring, now. Well, when life hands you a grease burrito, there’s nothing to do but pack bearings. 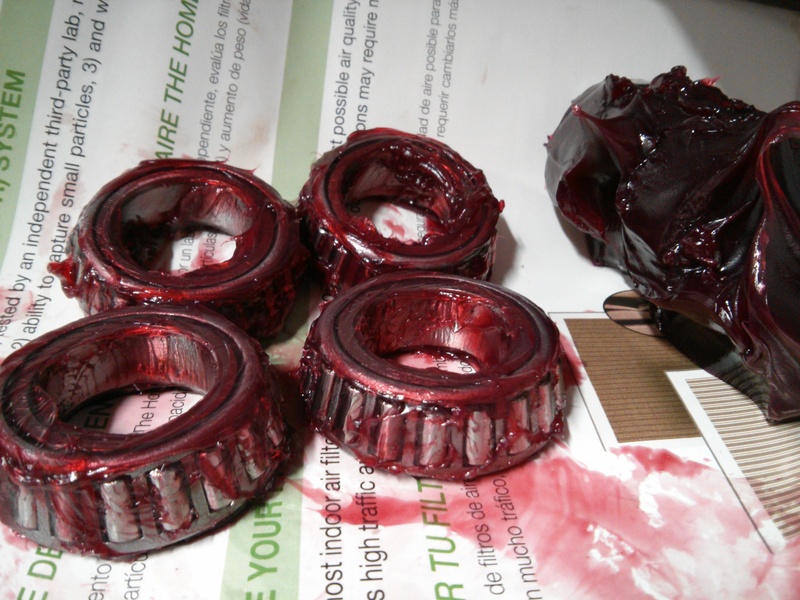 This was the grease that we bought for redoing the bearings in Shorty, so while I can’t tell you what the various specifications are, I can tell you that it probably just fine and is definitely going on those bearings over there. And since I’ve done this by hand before for Shorty, I almost know what I’m doing. I did consider wandering around American Steel to see if someone had the tool for doing this but I’m not going to be able to use this handsome grease burrito in my hand if I go do that. Once that was done, I spent a good 15 minutes washing layers of grease off my hands til I got to the point where I could pull the earplug out of my ear. We took Lava to the shop today. 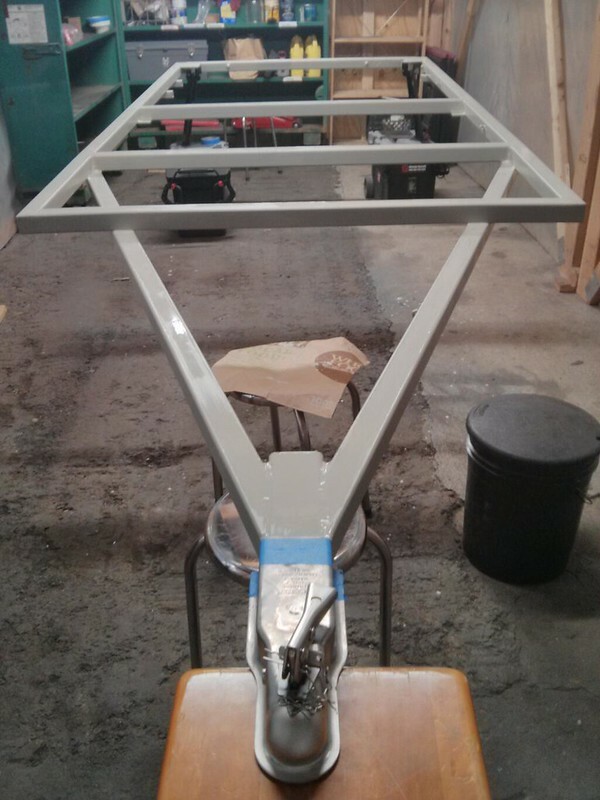 What do you do after priming a trailer frame? You paint it! Then, you watch it dry, flip it over and paint it again. Once that dries, you flip it and paint it some more. Paint, dry, flip, paint, dry, flip, noticing a pattern here? 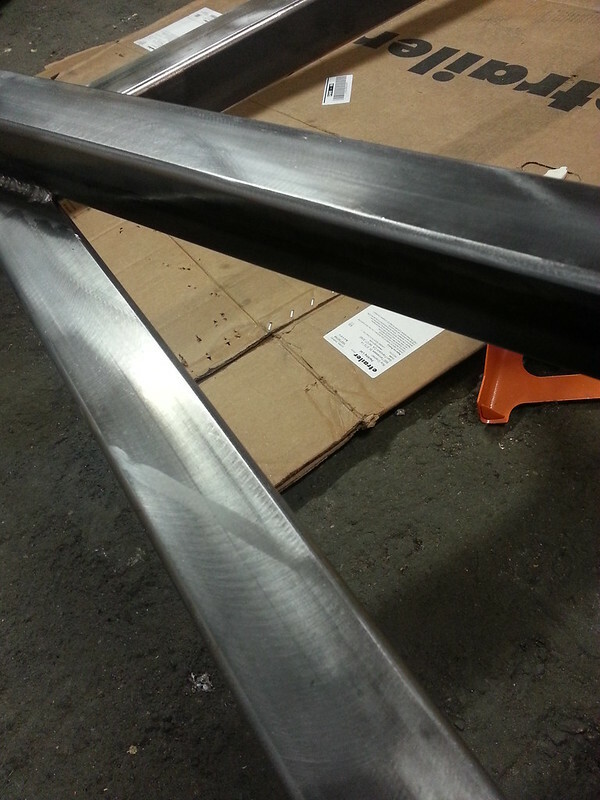 We’re using ultra high gloss paint, so even after it dries, it’s got quite a bit of shine to it. Ideally, I’d like for it to have a nice Bakelite look to it, we’ll see how the final version turns out. Bad pun, I know. Blame Roy. This weekend, we smoothed out the few remaining burrs on the frame, brushed it, knocked the rust off and cleaned it, then gave it a coat of primer. Flipped it on it’s back, primed the bottom and sides, let it dry. Came back the next day, flipped it right side up, primed the top and touched up the sides. It was sweaty, stinky, and somewhat tough because it was so nice outside, but it’s done now. Left a wet paint sign on the front and called it a day. At some point, we were asked “Wait, don’t you guys live in San Francisco?” Yes, yes we do. 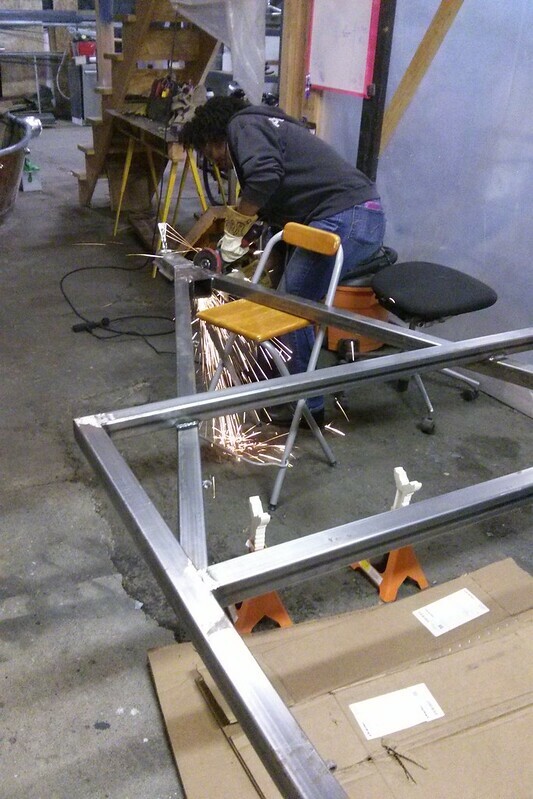 “Where do you find space to up and build a trailer in San Francisco?” The answer, my friends, is Oakland. Roy and I went in with some friends on a space at American Steel Studios in Oakland, and so far, we’ve been really happy with it. It’s the old American Steel complex on Mandela Blvd, which used to be the Cypress Structure before the Loma Prieta earthquake. After they tore down the structure, it became Mandela Blvd, with a park and path through the middle. It’s a great space to work in, with really interesting neighbors in the complex. You can find fine artists, industrial artists, commercial vendors, and just about everything in between. The complex is packed full of people that make things. I’m still not quite sure where we fall on the spectrum, whether we’re industrial artists, or closer to the neighborhood of craft work. Doesn’t really matter right now. I’m just happy we found a studio to call home. I was somewhat surprised that our plan wasn’t significantly changed after contact with the enemy. I’d realized after closely examining the Timbren Axle-less Suspension and documentation that we’d probably need to move the crossbar near the middle a bit, and had never really been too sure how the transition from the a-beams to the coupler was going to work. 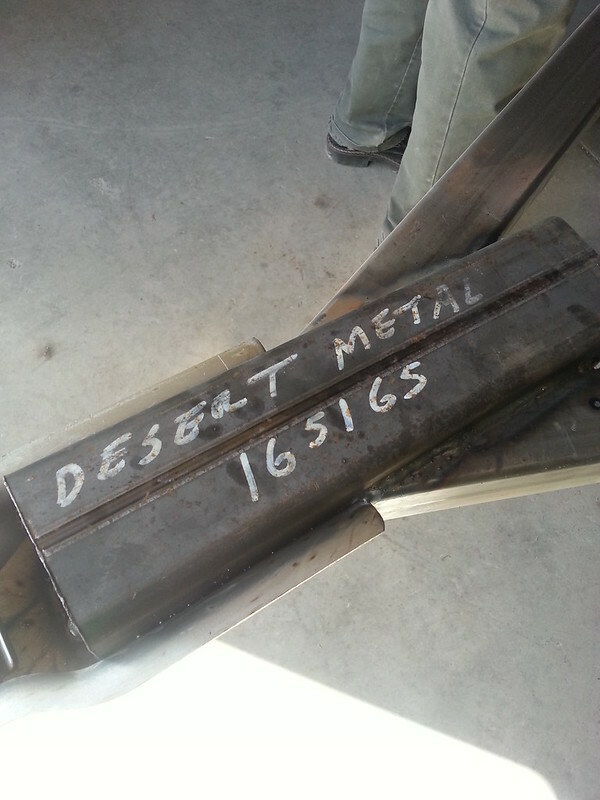 Luckily we had some expertise at Desert Metal in Lovelock, NV to show us the way and make things happen. I love toast. I mean really love toast. When I was little, I would wake up in the morning, go to the kitchen, and make myself toast. Preferably with lots of butter, jelly, and cheese, or the occasional smear of Braunschweiger. (Don’t judge me!) 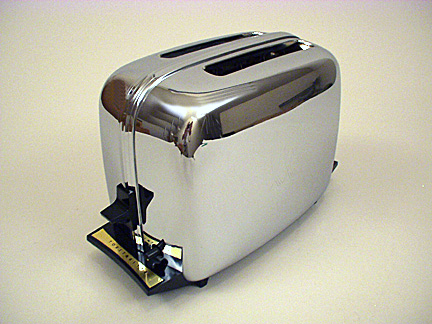 The toaster would greet me every morning, gleaming and faithful. It was the toaster my parents got for their wedding in 1962. It was a Toastmaster. When I started making noises about building a second trailer, Roy and I agreed that we needed some sort of design or theme to build around. 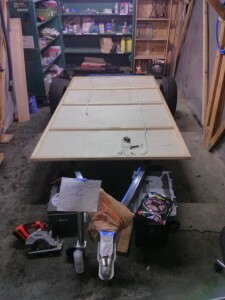 The first trailer was done because I wanted to build a trailer, period, and design and planning didn’t really enter the equation until after the fact, when we looked at it and thought “Wow, that’s kinda generic.” Riffing one night, we landed on the topic of the toaster, my childhood toaster, and all the good feelings I associated with it. The closest profile we could figure to match the profile was a Benroy, so that’s what we used as a starting point for our plans. It looks rather toastery. And voila! A theme was born! It was a full, but super productive day! We couldn’t tow the trailer back home with us, no VIN#, no plates, and since we were driving so far, we opted to rent a cargo trailer, load the frame onto it, and drag it back home. 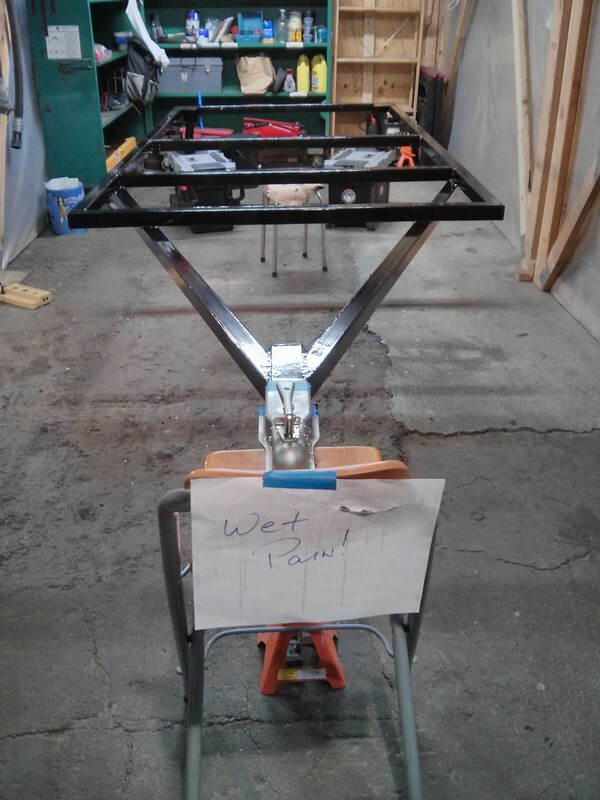 It worked great, and we were able to unload the frame at American Steel yesterday!